Today our focus is turned to our husbands. Let me present my disclaimer from the start. I am fully aware that households are made up of different circumstances. It may be that you are a single mom or perhaps your spouse is an unbeliever. In such cases, I believe God can give you the strength to be the spiritual leader in your home just as well as any other household. But, today our focus is on our husbands and their role in becoming a praying family. The saying is trustworthy: If anyone aspires to the office of overseer, he desires a noble task. 2 Therefore an overseer must be above reproach, the husband of one wife,[b]sober-minded, self-controlled, respectable, hospitable, able to teach, 3 not a drunkard, not violent but gentle, not quarrelsome, not a lover of money. 4 He must manage his own household well, with all dignity keeping his children submissive, 5 for if someone does not know how to manage his own household, how will he care for God's church? God has ordained our husbands to be the spiritual leader of our household. This includes leading the family in the way of prayer. Although we can’t make our husbands take that responsibility to be the spiritual leader of their home, nor force them to pray with or over their family, there is much we can do to be an influence and lead them in that direction. Here are two main keys to seeing your spouse become the spiritual influence that you want in your household. Number 1: Be submissive and subject yourself to his leadership. It is our responsibility as their wives to follow our husband’s lead. I know this is a hard one for women in our culture to gulp down, but the fact still remains, THIS is how we can be influencers to our husband! In my own journey, this has been incredibly difficult to learn to do. I have always been the take charge kind of gal. It was not until very recently that I learned I need to allow my husband to make decisions concerning ME and my family! I hadn't noticed how “silent” my husband had become in making decisions for our family, only to discover that he had “given up” because I never “listened” to him anyway. Now, I work really hard to bring even the smallest decision (especially spiritual in nature) to him first. I will then ask my husband to pray over me and that God would show both of us what is the right decision to make. Then I will ask him. If he has a direction he thinks we should take, I choose that direction without an argument. I have found, since I have made this conscious effort to let him lead, he has been more willing to be a part of leading us as a family. I believe there is no greater thing that you can do for your husband than to pray for him! He needs to be lifted up in prayer each and every day! 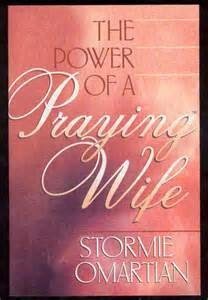 One of my favorite go-to books is The Power Of A Praying Wife by Stormie O Martian. This book is jam-packed with prayers that get to the heart of the matter. It gets very specific on what areas to pray concerning your husband and scriptures to go along with those prayers. Pray that your husband will take on his call to lead his household in the ways of the Lord. Pray that he will become the prayer warrior that God has called us all to be! I also found this prayer to be very helpful in guiding me to pray for my husband to be the spiritual leader God wants him to be. Please guide our husbands to be the true, Godly leader that you want them to become. So many families today are in crisis, a problem that may well be solved by men taking their rightful role as the leader of their family. Please help them to be good examples to their children, especially their sons. And, God, please help us, as their wives, to allow our husbands to lead…to provide encouragement, to avoid thwarting their initiatives, to make room for our men to bloom as the leaders they were meant to be. Please help us to remember to pray daily to the Holy Ghost for guidance for our husbands to lead throughout their day. 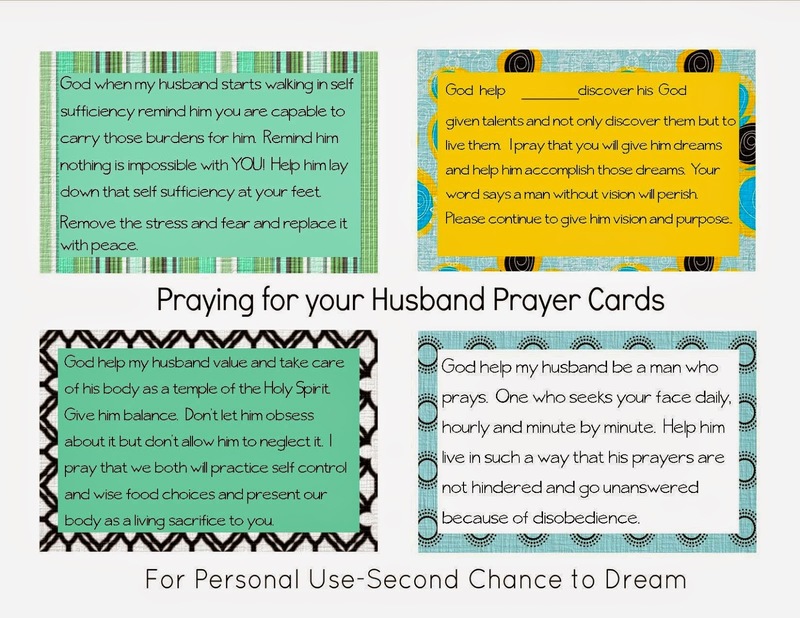 Here are some prayer cards that can be printed out as reminders to pray for our husbands every day! Be blessed as your family grows closer through the power of prayer. Wonderful encouragement. I strive to let my husband lead, but sometimes I take over the reins. It is something I am always trying to be intentional with. And I LOVE Stormie's book!